All of our favorite childhood snack is now available in a low carb form with this Sugar Free Graham Crackers recipe! Not only do we like to snack on them by themselves, but we low using them as a the graham portion of our low carb smores recipe. Who doesn't love a low carb, cinnamony cracker, sandwiching chocolate and marshmallow topping?! We sure do! Now You Can Make Homemade Graham Crackers Too! Matthew and I have just started getting into making our own nut butters, and trust us when we say, homemade is always better! We'll have those nut butter recipes for you shortly, but in the meantime you NEED to make homemade, sugar free graham crackers because homemade always tastes better! The benefit to homemade is you know exactly what is going into the foods you are putting into your body. No preservatives or ingredients you can't pronounce means a healthier you. Since being on a low carb diet for two years now, we've made our fair share of low carb snacks. Snacking can sometimes be essential to getting through the day and we understand that. We want you to have options when the urge to snack comes upon you instead of having to deny yourself! However, if graham crackers aren't your jam, you can turn to our Parmesan Crisps, High Fiber Muffins or Curry Deviled Eggs for some great low carb options! The best part about this snack? Making smores of course! You can also travel easily with it and it is shelf stable for up to 1 month, if it will last that long. We always get asked what to take for snacks on road trips or while traveling for work and now you have the ultimate, low carb, satisfying snack! These are extremely kid friendly too, so next time you're meal prepping or trying to think of something to make for your kids that you can eat too, make these sugar free graham crackers! ​Tip: If you want to use erythritol instead of stevia you can replace the 20 drops with 3-4 tbsp of erythritol. For swerve you should use 2-3 tbsp. 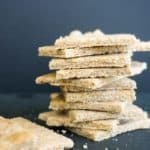 Recipe can be quickly added to MyFitnessPal - Search "KetoConnect - Sugar Free Graham Crackers"
Pour the mixture out onto parchment paper and form a mound with your hands. Place another piece of parchment paper on top and using a rolling pin (or anything rollable) roll out the mixture into a thin layer. Using a sharp knife or pizza cutter score the flattened out mixture into as many big or little crackers as you want. Finally, use a fork to score the crackers giving it it's classic graham cracker look! Bake graham crackers at 300 degrees for 20 minutes. Allow to cool before breaking apart and enjoying! TIP: If your mixture seems to crumbly, add more butter. NOTE: The amount of crackers this recipe yields will vary on how many crackers you decide to make. We made 20, which is reflected in the nutrition.